Surfing makes you more likely than the next person to get an ear infection. Having surfers ear or perforating your ear drum whilst surfing makes it even more likely. Whilst very rarely dangerous, they can be very painful, disorientating and worse of all keep you out the water. There are simple preventative measures you can take, and things to do if you’re getting pain. Ear canal (Outer Ear) infections are a common problem encountered by surfers in both temperate and tropical climates, although it is more likely in warm humid climates. Surfing increases your risk of getting an ear canal infection 5 fold. Surfing in clean sea water is better than dirty sea water. Complicated stuff! The longer your ears remain filled with water after a surf, the increased chance of getting an ear infection. Having ‘Surfers Ear’ (exotoses) means that you’re more likely to have crap retained in your ears like sea water, dead skin and ear wax. This is bacteria’s equivalent of G-land and they can’t wait to go camp there. This obviously makes your ear more prone to getting an infection. There are a large number of different bacteria that like the ear but the common one in surfers and divers appears to be a bug called Pseudomonas aeruginosa. This is the Kelly Slater of the ear infection bug community. Going in the water a lot and for long periods gets rid of the bacteria that normally live in your ear canal and replaces them with one that that’s a bit more hostile. It’s this hostility that usually precedes the ear canal getting infected. Painful ear which may become worse when you move your jaw. You may have reduced hearing on that side. Rarely the ear can discharge dirty fluid. For an accurate diagnosis a Dr needs to have a look in your ear. There is always the possibility that you have a perforated ear drum and/or a middle ear infection which has different consequences. Pain killers. Drugs like Ibuprofen work really well because they help reduce the inflammation. Gentle cleaning of the ear. There are special cotton wicks you can buy in pharmacies. You can use cotton buds but be sure not to ram it in and that the cotton isn’t going to come off in the ear. Be careful not to cause damage to the ear. Use clean water that can have a small amount of betadine or another anti-septic added. Never use hydrogen peroxide as it will irritate the already agitated skin in the ear. These are easily bought over the counter in tropical countries. The best one to go for usually contains an anti-biotic called Neomycin and a steroid. 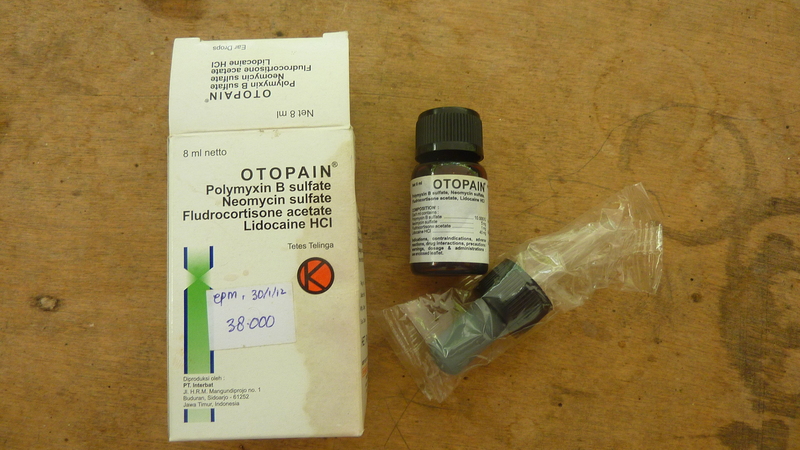 Some contain a local anaesthetic agent too to help with the pain. The drops shouldn’t be used for more than a week as this can lead to fungal infection of the ear. Put the drops wit your head on one side bad ear facing up. The ear should feel full after. Can I Help Prevent It? Sea water that dries in the ear canal causes formation of salt crystals. These crystals can keep moist and keep the ear canal wet. Rinsing the ear with fresh water prevents this from happening. If you have problems in the past with ear canal infections then you could consider using olive oil drops to help clean the ear. Much more common in kids than adults. The ear becomes painful and you can become to feel unwell. These are much less common than outer ear infections. They can occasionally become a problem after an ear drum perforation that’s resulted from trauma to the ear. Water & blood in the ear provides good conditions for bacteria and they are able to get into the ear from the outside. The chances of getting a middle ear infection after a perforated eardrum are increased if you’ve had a recent cold/sore throat. 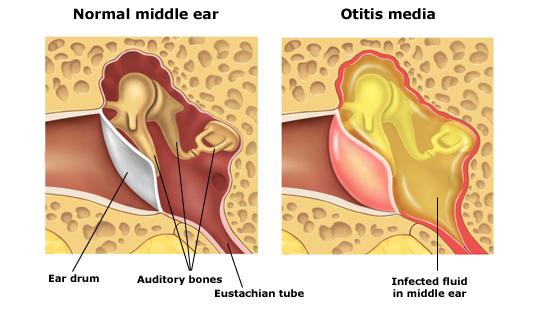 Middle ear infections without a perforation should not be treated with antibiotics as they are usually caused by viruses. Perforated ear drums are discussed in a separate article. Its sensible that any perforated ear drum sustained whilst surfing is treated with anti-biotics. This is because blood and water in the middle ear are a great mix for bacteria to grow. Amoxicillin being the drug of choice. Remember to think about if you have any known allergies to anti-biotics. Middle ear infections can only really be diagnosed by a Dr that looks at the ear drum. If you’ve got ear pain and hearing loss and/or start to feel generally unwell it’s best to seek out a Dr.